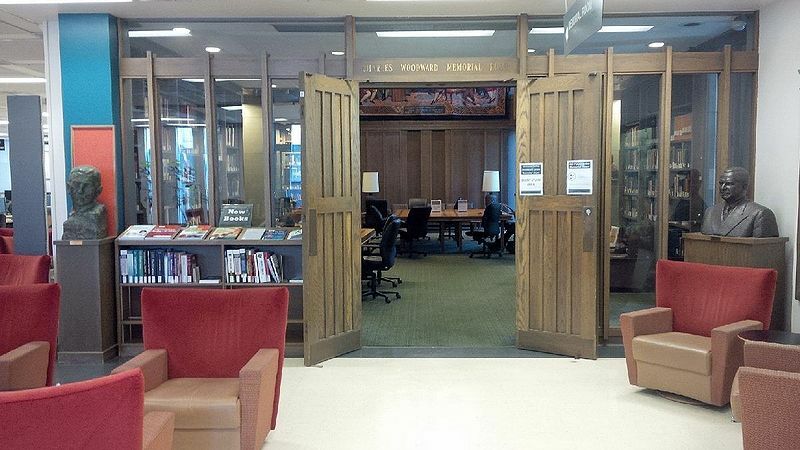 Situated on the Main floor of the Woodward Library, the Charles Woodward Memorial Room is open for silent study. Drinks with lids are allowed, no food may be eaten in this room. The Memorial Room, dedicated to the pioneer physicians of British Columbia, was the gift of Mr. P. A. Woodward in honour of his father Charles Woodward, founder of the former department store which bore his name. Display cases - Provided by a grant from the Mr and Mrs P.A. Woodward's Foundation. These cases currently display surgical instruments and medical artifacts and bring the history of science and medicine to the present. The W. C. Gibson History of Science & Medicine Collection is named for Dr. William Gibson. Rare books and manuscripts from this collection are housed in UBC Rare Books and Special Collections. Expanded remarks by Professor Emeritus, Wm. C. Gibson, D.Phil. (Oxon) M.D., F.R.C.P., September 7, 1988 at the dedication of the Historical Collection of the Woodward Library, University of British Columbia. The UBC Life Sciences Libraries thanks Dr. William Gibson for his kind permission to reproduce his comments on the Historical Collection of the Woodward Library.